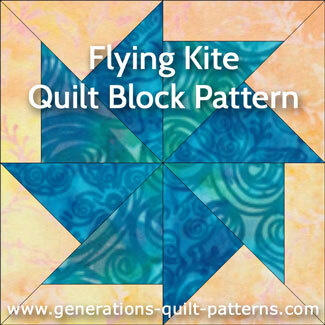 Making a Flying Kite quilt block is Easy Peasey when you paper piece it! No templates to fiddle around with and perfect little blocks...every time! And the seam allowances are ALWAYS pressed in the right direction. 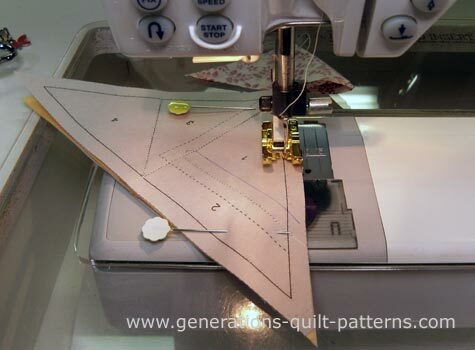 Set up your sewing machine for paperpiecing: reduce the stitch length to 1.5 or 15-18 stitches/inch, install an open toe applique foot and, if you find it difficult to remove the paper after all the stitching is complete, install a 90/14 needle. If you haven't tried it, check out our Best Pressing Technique for the flattest paperpieced blocks you've even seen. You'll need to have Adobe installed on your computer. If you don't have it, click here to go to Adobe's website to download and install the most current version of the program. 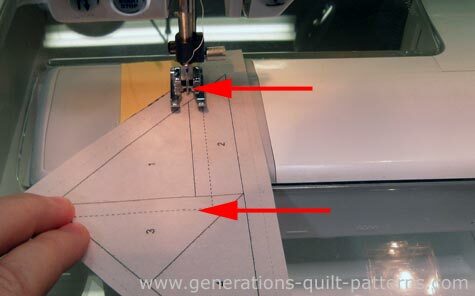 Remember before printing either pattern sheet set 'Custom Scale' to '100%' under the 'Page Sizing and Handling' heading in order to print the correct block size. There's a 1" square on the download page to help you quickly assess if it's right. NOTE: The pattern will look like it's backwards and that's exactly right. It's because the unit is asymmetrical and the printed side is actually the backside of the block. While many quilters use 'hunks' of fabric to paperpiece with, I prefer to pre-cut my patches for traditional blocks. There's less fabric waste, but more importantly, pre-cutting ensures that the outside edges are on the straight of grain. This makes for a more stable block. 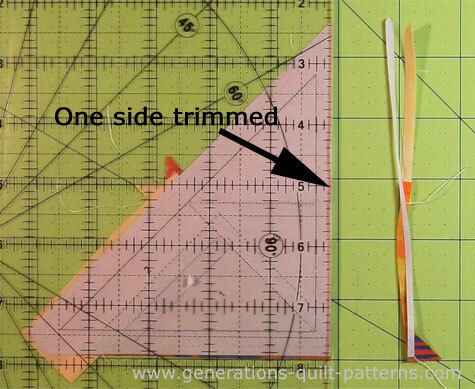 After stitching a few, make any adjustments you need to the cut dimensions suggested below. Patches #3 and #4, though identical in finished size, are cut at different sizes to ensure there is adequate fabric around the outside edge for trimming to a perfect block at the end. Cut the units apart between the dashed lines. This is a rough cut—everything will get prettied up at the end—even all those scraggly thread tails! Dab a dot of Elmer's glue stick (the one that goes on purple and dries clear) on the unprinted side of the pattern behind #1. 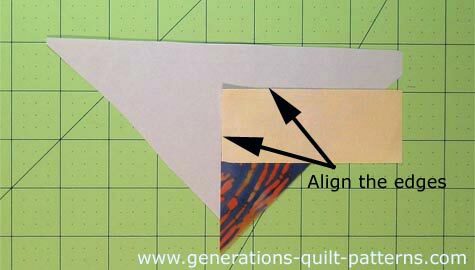 Adhere the wrong side of your fabric Patch #1 to the paper, using the dashed lines for foolproof placement. You can see how the fabric extends past the dashed outline. 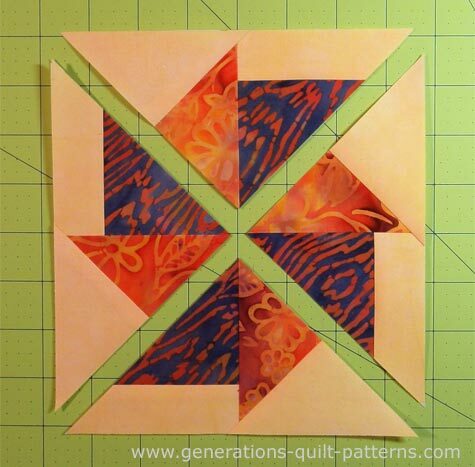 We'll trim the excess off at the end for a perfect block. Stitch on the solid line between #1 and #2, starting and stopping past the dotted lines. Position #3, RST, with the sewn patches—the long edge with#2 and the short edge with #1. Stitch the seam between #3 and #1. At this point, we need to trim #3 to establish the placement line for the final patch. Match the edge of your ruler to the black seamline between #3 and #4. 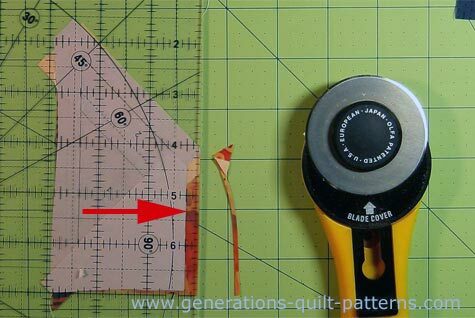 To crease the paper along the ruler's edge, you'll need to pull the it away from the stitching (see the red circle below). If you accidentally rip the paper too far, you can use a piece of Scotch Brand Magic Tape to repair it. Just be careful not to iron directly on the tape—it will melt! This shouldn't be a problem though, as all the pressing is done from the fabric side of the unit. 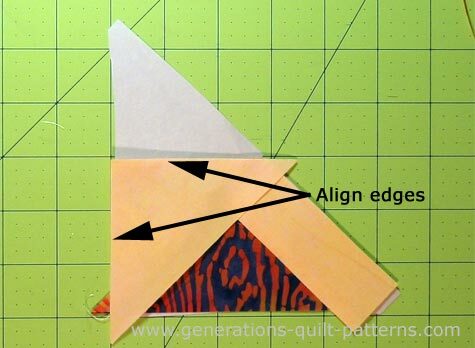 Line up the 1/4" mark with the folded edge (red arrow) and trim with your rotary cutter. Align the short bias sides of #4, RST, with the sewn unit. Stitch the seam between #3 and #4, starting and stopping outside the dashed lines. 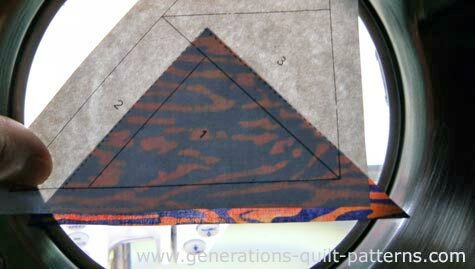 To trim the units to size, align the 1/4" mark of your ruler with the solid black outside line of each triangular units. Trim with your rotary cutter and repeat for all sides of all four units. I do trim all three sides at this point. 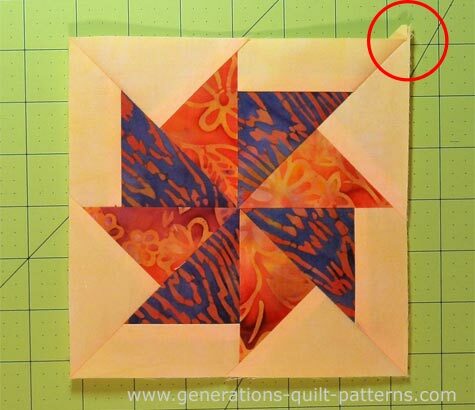 However, if your block regularly comes up a smidge too small, wait to trim the outside edge of the block until all the units are sewn together. Lay out the units as shown below. Unlike many of the blocks in the library, the units of our Flying Kite are triangular instead of square. 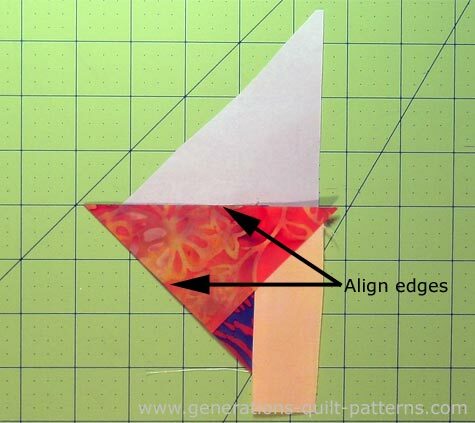 One of the benefits of paperpiecing is that the seam allowances will automatically nest if you follow the order of piecing provided. Select two adjacent units and with RST pin them, nesting the SA at the center. 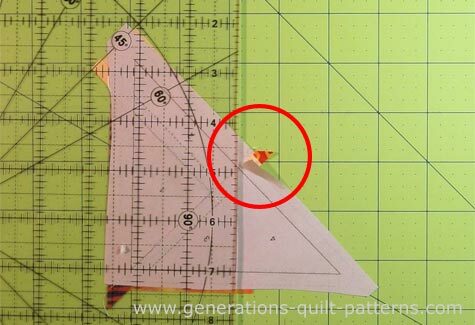 I like to feed the center or squared end into my sewing machine first. You can see in the photo above that I've switched back to my regular 1/4" foot. 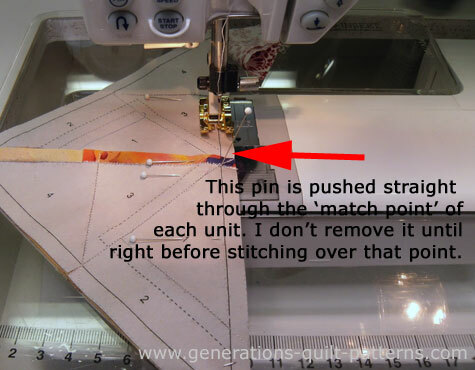 I am stitching just at the right edge of the black line, at a scant 1/4"
I've found that it's not necessary (most of the time) to push the pin through both layers of paper—through the top layer and then both fabric layers is usually enough. Repeat for the second pair. With RST, pin the two halves together, again taking care to match the center. Stitch starting and stopping past the dashed outline. Press. Twirl the SA if you'd like to reduce bulk in the center of the block. 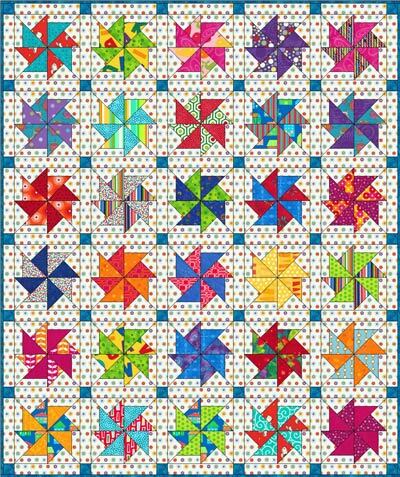 Now swap in all sorts of bright kid prints and you'll have a terrific baby quilt! 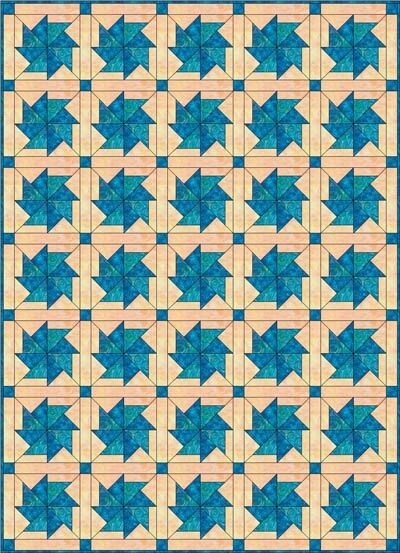 ...click here to go to our Free Quilt Block library and click on any of the blocks that interest you! Then check out these related books available on Amazon.com. 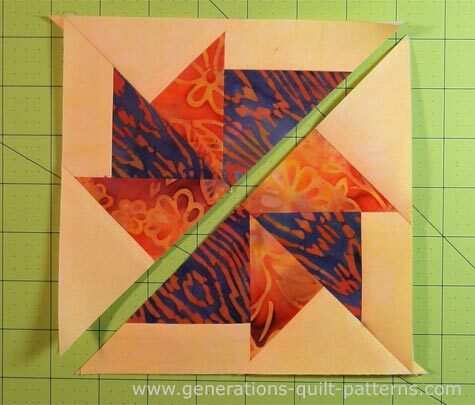 "50 Fabulous Paper-Pieced Stars: CD included"